Overview: The training manual includes essential guidelines, definitions and resources for running training on AHT. It also includes links to other tools of the United Nations Office of Drugs and Crime (UNODC). The training material is designed for public sector representatives (including policymakers, law enforcers, judges, prosecutors) as well as civil society organizations (including NGOs who work on preventing trafficking, protecting and assisting victims and promoting international cooperation. The CTIP is based on the training methods of the United Nations Office on Drugs and Crime (UNODC). 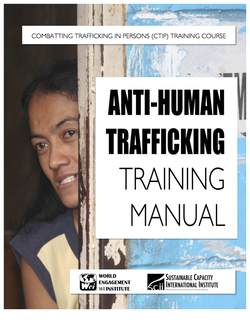 As part of its mandate, UNODC offers various useful resources in combatting human trafficking. Overview: This bibliography contains a sampling of research for the theory and practice of anti-human trafficking work. It has been compiled from various sources and is meant to be a guide to the wealth of resources available on the issue of Human Trafficking. It is by no means exhaustive. To facilitate your search, the references below are divided into categories. Simply click on one of the following categories to move directly to that section of the bibliography. Sections: SPECIAL REPORTS ON HUMAN TRAFFICKING | UNITED NATIONS PROTOCOLS | GUIDES & TOOLKITS | HUMAN TRAFFICKING AND MIGRATION | HUMAN TRAFFICKING AND ECONOMIC DEVELOPMENT | HUMAN TRAFFICKING AND GENDER | HUMAN TRAFFICKING AND HUMAN RIGHTS | HUMAN TRAFFICKING AND HUMAN SECURITY | HUMAN TRAFFICKING AND SEXUAL EXPLOITATION. Compiled by the United Nations Office on Drugs and Crime (UNODC), the Global Report on Trafficking in Persons (Global TIP) is based on data gathered from 155 countries and offers the first global assessment of the scope of human trafficking and what is being done to fight it. It includes: an overview of trafficking patterns; legal steps taken in response; and country-specific information on reported cases of trafficking in persons, victims, and prosecutions. The Report shows that in the past few years the number of Member States seriously implementing the Protocol has more than doubled (from 54 to 125 out of the 155 States covered). However, there are still many countries that lack the necessary legal instruments or political will. Published annually, the report for 2014 highlights how impunity prevails, with the number of global convictions remaining extremely low despite a continued increase in the number of detected child victims. This is the annual report released by the US State Department that chooses one specific area of human trafficking to concentrate on and give background, explore present conditions around the world and set goals for the next year of addressing this pressing issue. The report also points to the problem of forced criminality in human trafficking cases and states that "Trafficked individuals who are forced to commit a crime are commonly mistaken for criminals—rather than being identified as victims—and therefore treated as such by law enforcement and judicial officials" (pg.14, 2014). The report goes onto to draw connections between global sporting events and elevated trafficking, and in line with 2014's theme, "From Victim to Survivor" gives concrete examples of solutions that are in work and creating progress. IOM has compiled information on all trafficking cases assisted by the organization in 2011. This is a process which has been on‐going in the context of a J/TIP funded project to support the IOM human trafficking database tool. Programmatic data is collected and stored through two channels: (1) the IOM MIMOSA based Human trafficking database; (2) and the ‘sister’ core variable approach. (1) Through the IOM MIMOSA4 based Counter‐Trafficking Module (CTM) otherwise known as the IOM human trafficking database, the IOM Migrant Assistance Division can to date report upon numerous variables for all cases encoded into the system from 2000‐2010. This covers approximately 20,000 cases encoded by 72 different missions. Screening interviews, undertaken upon first contact with the trafficked person, assess whether an individual was trafficked according to the definition provided in the Palermo Protocol and also their immediate protection needs. Assistance interviews, undertaken once the individual has accepted IOM assistance, document the victim’s background, recruitment and transportation, trafficking experience and their assistance and/or re/integration needs, including what service are (and are not) provided. The IOM database encodes data about individual trafficking victims according to these standardized interview forms. This standardized data is further supplemented by qualitative data from interviews with trafficking victims, which allows for the documentation of details that fall outside of the standardized fields and adds depth to the information collected. Interviews are undertaken by service providers, either an IOM staff or an NGO or GO partner with whom IOM works in providing direct assistance. The data in this document was compiled by IOM Headquarters staff, Anvar Serojitdinov, Project Officer, aserojitdinov@iom.int in conjunction with the assistance of IOM field missions. All enquiries can be addressed to the given email address or directly to the appropriate IOM mission. The signing of this convention by the international community demonstrated the political will to answer a global challenge with a global response. It sent a clear message - if crime crosses borders, so must law enforcement. In response to one of the most egregious violations of human rights - the trafficking of persons, particularly women and children, for forced and exploitative labor, including for sexual exploitation, the Protocol to Prevent, Suppress and Punish Trafficking in Persons, Especially Women and Children was introduced in 2000. Also known as the Palermo Protocol, 117 nations have since ratified this treaty in an attempt to counter the scourge of trafficking that is rooted in social and economic conditions in the countries from which the victims come, facilitated by practices that discriminate against women and driven by cruel indifference to human suffering on the part of those who exploit the services that the victims are forced to provide. The Florida Trafficking Initiative is a project of The Center for the Advancement of Human Rights at Florida State University. Funded by the Florida Department of Children and Families, Office of Refugee Services, this project endeavors to bring together representatives from three U.S. Attorney Offices, local and state law enforcement, state attorneys, refugee assistance organizations, non-profit domestic violence, sexual assault advocates and other NGOs to address trafficking in our State. The Florida Trafficking Initiative involves collaboration among organizations and individuals from across the State of Florida. Florida's resettlement program is the largest in the nation, resettling 20,000 nearly refugees and entrants annually, more than double that of the next largest state. Since FY1990, Florida is home to nearly 200,000 refugees and immigrants. Through its refugee network, Florida offers a wide variety of programs to help with the resettlement of new arrivals, including employment, vocational education, English language training, crime prevention, health care, citizenship, childcare, and youth, elderly and family services. United States Congress considers revising the current policy on how unaccompanied children should be treated in terms of asylum and expedited removal. Should unaccompanied children stay or be sent back? Those who support the expedited removal, argues that children who meet the “credible fear threshold” should be able to request asylum. For those who support the current policy, wants to give the unaccompanied children the opportunity to recover from their potential traumatizing journey before making their asylum claim. The treatment of unaccompanied alien children was included in the Trafficking Victims Protection Reauthorization Act (TVPRA) in 2008. The initial screening by TVPRA determine whether or not a child should be returned to their country or be transfer to Department of Health and Human Services’ (HHS) and placed in removal proceedings. United States Citizenship and Immigration Services (USCIS) requires asylum officer to conduct “child-appropriate interviews taking into account age, stage of language development, background, and level of sophistication”. USCIS would take the jurisdiction over the asylum application with pending claims in immigration court, if the child is unaccompanied alien child. (Congressional Research Service 2014). In recent years, the smuggling of human beings across international borders has grown rapidly. A small-scale cross border activity affecting a handful of countries has become a multimillion-dollar activity that is global in scope. Information about human smuggling — the numbers of people smuggled, the conditions that they endure in transit and their treatment on arrival — is patchy at best. It is currently estimated that some 800,000 people are smuggled across borders every year. These figures mask the complex and various experiences of the men, women, and children caught up in such processes. Those who are smuggled include political refugees, those fleeing conflict and violence of various kinds, and economic migrants in search of a better life. Overview: This special issue of Development Bulletin offers a good overview of fundamental issues on human trafficking in relation to human security. About 10 years ago, when trafficking of women, men and children was becoming a major international issue, the collected articles offered a overview of the various ramifications in national politics, legislative developments, criminal punishment, corruption prevention, respect of human rights, migration and poverty. In the same year when the notion of human security came to the international attention, this publication has been relevant to show the connections of human security and anti-human trafficking specific to the Australian context but also relevant to many other global and glocal contexts.